Rishikesh, along with Mysore, is one of the most popular destinations for yoga in India. There are numerous ashrams, and numerous styles of yoga and meditation, to choose from. Hence, it's important to investigate which best meets your needs. 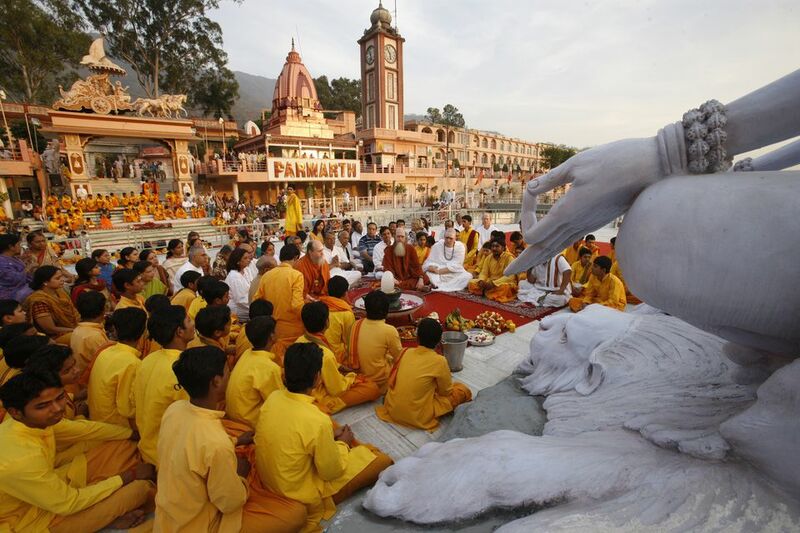 Find out about some of the top Rishikesh ashrams and what they teach in this article. Parmarth Niketan, on the banks of the holy Ganges river in Rishikesh, is one of the top yoga centers in India and the biggest ashram in the area. It has 1,000 rooms on its sprawling eight acre campus, with various rates depending on the standard of accommodations and view. Initial stays of up to 15 days are permitted. Two yoga classes and three meals daily are included in the price. The ashram also runs an extensive program of yoga, Vedic heritage and spirituality, and teacher training courses. Outsider visitors are welcome to attend daily classes by giving a donation. The ashram's evening Ganga aarti is popular. Read reviews on Tripadvisor. Another of India's top yoga centers, Sivananda Ashram was founded by Swami Sivananda and is run by the Divine Life Society. Teachings are based around the five points of yoga -- postures, breathing, relaxation, meditation, and diet. Free yoga and meditation classes are offered daily. However, accommodations (which are also provided free of charge, along with food) are only available to serious spiritual seekers who need to apply at least a month in advance. The ashram is located near Ram Jhula, adjoining the main road. Read reviews on Tripadvisor. Omkarananda Ganga Sadan, the guesthouse of the Omkarananda Ashram Himalayas, is home to the Patanjala Yoga Kendra yoga center. Iyengar yoga classes are the specialty there. The center is located at the Muni-ki-Reti area of Rishikesh, on the banks of the Ganges river. It has its own ghat, and a daily aarti is performed. Daily (except Sundays) yoga classes are open to everyone but reservations need to be made months in advance for the intensive yoga courses. Lectures on the Bhagavad Gita are also offered. Accommodations are reasonably priced and clean, and many rooms have river views. Yoga Niketan was founded in 1964 by Swami Yogeshwaranand Paramahansa, a renowned master of Raja Yoga who spent most of his life in the Himalayas. The teachings of this traditional ashram, which is located in the Muni-Ki-Reti area of Rishikesh, are based solely on the Eight Fold Path as per the Patanjali Yoga Shastra. Students must follow the strict daily schedule of yoga, meditation, and lectures. The ashram has 100 comfortable rooms available for students, all with private bathrooms and hot water. Sadhana Mandir was founded in 1966 by Swami Rama, author of Living with the Himalayan Masters, and many other renowned spiritual books. Meditation, in the 5,000 year old Himalayan Tradition, is the focus of the teachings at this ashram. It has a quiet garden setting on the banks of the Ganges River, but away from the hustle and bustle of Rishikesh. Various retreats are offered, including weekend retreats and longer 10-day retreats. Swami Rama Sadhaka Grama was founded by Swami Veda Bharati, a disciple of Swami Rama. This "village of spiritual seekers" offers meditation instruction in the Himalayan Tradition, and is also a highly regarded center for scientific research into yogic meditation. Accommodations, limited to 100 guests at a time, are provided in very comfortable self-contained cottages. There's a daily schedule of activities including meditation, breathing, and Hatha yoga. This ashram was established during the 1960s by Swami Dayananda Saraswati, an internationally recognized teacher of Vedanta and scholar of Sanskrit. It's located in picturesque surroundings, around 10 minutes walk from the Ram Jhula area. Regular residential courses are conduced, with focus on Bhagavad Gita and the Upanishads. Vedic chanting is also taught during the courses. In addition, visiting teachers conduct Iyengar and Hatha yoga retreats (suitable for beginners and intermediate students) at the ashram. More than 150 rooms with attached bathrooms are available for students. Meaning "Land of Flowers", Phool Chatti ashram was founded in the late 1800s (yes, it's old!) and is located in a peaceful natural setting upriver from Laxman Jhula. The ashram is renowned for its frequent seven day yoga and meditation program. The teachings focus on the full spectrum of the yogic path and ashram life, not just asanas (postures). Students will get to experience meditation, breathing (pranayama), cleansing, chanting, mauna (silence), puja (worship), kirtan (sacred singing), and other important aspects of the yogic path. There are opportunities for meditative walks among nature as well. Anand Prakash Ashram was founded in 2007 by husband and wife team Chetana Panwar (a Canadian woman) and Yogirishi Vishvketu (who's studied Hatha and Raja yoga, and the Vedic healing arts, in northern India since childhood). They offer their own style of yoga called Akhanda Yoga, which has non-sectarian teachings from multiple sources and lineages. It incorporates balanced sequencing of asanas, pranayama, relaxation, mantra and meditation, as well as discussions and readings on the yogic lifestyle and yoga philosophy. Students can either stay at the ashram, stay elsewhere and attend all activities, or just attend drop-in classes. The ashram also runs 200 hour and 500 hour Yoga Teacher Training programs, and Ayurvedic cooking classes. It's located in the Tapovan area. Read reviews on Tripadvisor. Located a short walk up the hill from Anand Prakash, the compact Himalayan Yog Ashram was established in 2012. It will appeal to students who want to experience the complete yogic lifestyle in a personalized setting, and is ideally suited to those looking for a transformational experience. The program consists of a combination of postures, breathing, meditation, spiritual teachings, and wholesome organic Ayurvedic food. However, it's less about postures and more about going on an inner journey. Ayurvedic healing programs for detoxifying and stress are offered as well. There are only six guest rooms, each with private bathrooms. Stays of six, 13, 20, or 27 nights are possible. As well as the teachings, guests praise this ashram for its delicious food, serene environment, and welcoming hosts. Read reviews on Tripadvisor. If your focus is more on meditation than yoga, Shree Mahesh Heritage Meditation School offers a 300 hour meditation teacher training course, as well as meditation retreats and meditation for beginners courses. The school's approach is based on Vedic texts, and you'll also learn about yoga, Ayurveda, life healing, and spiritual development. In addition, there's a special non-residential Health Supportive Lifestyle Program that teaches healthy choices about diet, exercise and other lifestyle habits that can be easily applied in day-to-day life. Founder Ram Gupta has a degree in Nature Cure Science and Master Degree in Yoga and Meditation, plus more than 20 years of diverse experience in India and internationally. The Osho GangaDham ashram is situated on the Ganges River at Brahampuri, around 10 minutes drive from the Laxman Jhula area on Badrinath Road. Various types of Osho Active Meditation practices are taught at the ashram, and meditation camps are offered throughout the year. Alternatively, you can simply listen to discourses, or do nothing but relax there. Accommodations range from dormitories to deluxe private rooms. Is Sivananda Ashram in Kerala Worth its Reputation?